So far in Virginia (the state!) Sandy has battered our beaches & flooded neighborhoods in low lying areas, but we are in that ‘wait-&-see’ mode until she hits land later tonight up north. My prayers go out to the people in New Jersey, New York, Delaware, Pennsylvania, Maryland, DC, our Eastern Shore & all those who will endure the brunt of the storm. Hurricanes are taken seriously around the Woodward Home in Williamsburg, Virginia. When I lived at home for grad school in 1999, we were eating breakfast at the kitchen table (Papa was still getting up in his wheelchair an hour each day then) – KABLAAAM(!) Hurricane Floyd hit – literally- when a gigantic tree in our yard crashed onto our house & then my car (parked three times to avoid such an occurrence.) My brother & I ran out in the pouring rain to rescue my music CDs & soaked study papers, but Floyd smashed my poor car totally into smithereens. God is Good (all the time!) Altho the tree severely damaged the whole right side of our roof/attic, if it had fallen a few feet to the left, it would have hit us in the kitchen where lots of windows could have morphed into dangerous glass-missiles. Did i mention we were eating breakfast? In the kitchen? I remember our neighbor rushed over to help (Tim Hogan also came later to help hoist Papa into the center hallway of the house where we all sat huddled for the worst part of the storm – the tree fell well before the gale winds started kicking up!) 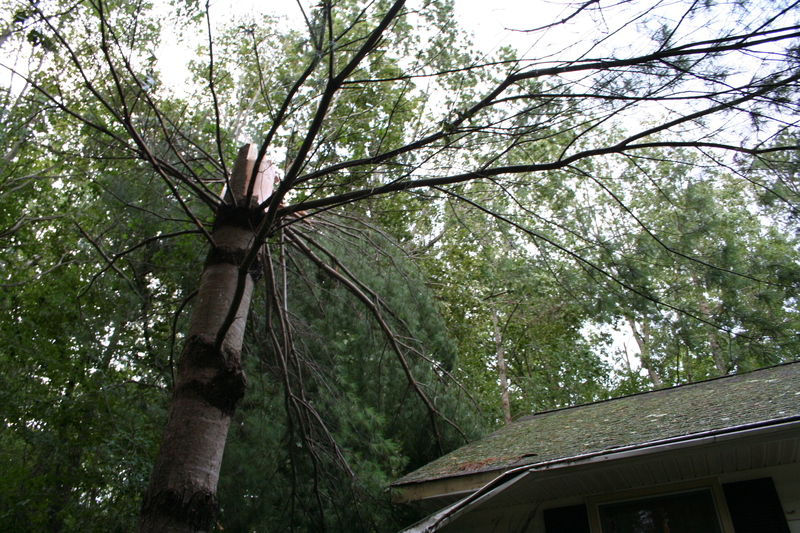 & Papa’s friends braved the elements to check on us … & then helped get rid of the Big Tree On Top of The House. After Hurricane Floyd, neighbors rowed up & down our 4-feet-water deep street for several days… two homes had to be totally rebuilt & several of my classmates in other parts of town had to find new places to live. More storms later… last year we weathered Hurricane Irene. Lots of tornado-ish whooshing winds ferociously attacked everything & rain, rain, RAIN poured down. The electricity went out for most of Williamsburg for 3 days to 3 weeks for those in outlying environs. The thing is, my older brother, Dean, & his wife, Lynn, & my niece, Jessey, came up from Virginia Beach (where Irene was supposed to be Very Bad) to stay with us during the storm (we have a super-duper generator to keep Papa’s hospital beds powered up & keep us going.) Turned out their neighborhood only lost power for an hour, but we were out for 4 days & the devastation around our town was huge. Now, more on that fallen tree pictured above. As Irene whooshed late into the night (sounding like mini-tornadoes), I was sitting in my room in my jammies (sleep hard to come by) when – CRASH – (ok, so i was texting my sister greatly relieved that she & my nieces had made it through the storm driving home from a wedding in Richmond)..
– crash, CRASH!… It sounded major. Looking out my window i could see nothing in the dark but tree branches up close & personal. Thankfully my room seemed to still be intact, but @6:15a.m. the next morning my niece & i trekked outside to assess the damage. Just as Jessey & I tried to figure out how to move a big tree a gazillion times bigger than us off the pumps, our neighbor Tim Hogan turned up (@ 6:30…) & promptly toted his chainsaw over to help us out. Voila: huge tree carefully moved off pumps & AC for Papa. Storms like Hurricane Sandy happen. 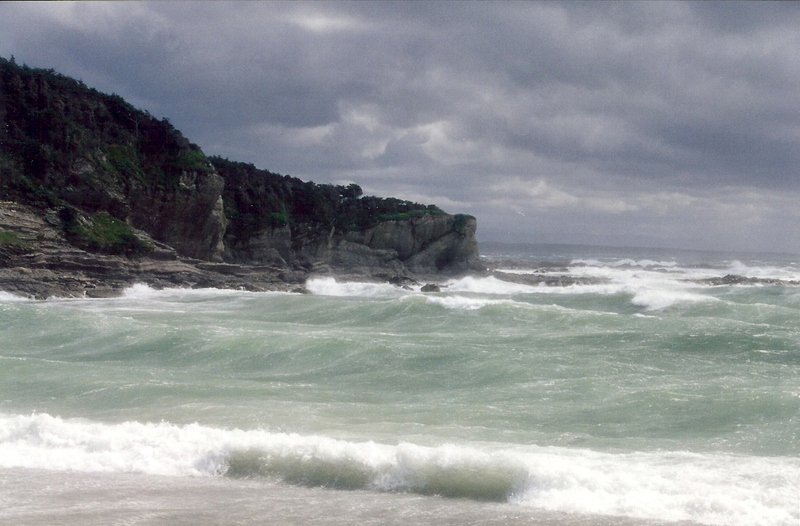 We can prepare, but storms are rather unpredictable… & often devastating. It’s very important during life’s storms that our foundations are secure. Not built on sand that washes away when the first 20 mile-per-hour winds hit…(& shallow roots like our early Floyd-toppled-tree) but built on Solid Rock that stands secure in the face of life’s devastating 100 mph+ winds. Faith is a choice. A solid foundation to keep us with the grace of God in the loving arms of God – no Matter What Happens. We are Not Alone. Loved ones, family, friends, neighbors — gifts from God to help us through our storms. … and GOD IS WITH US. p.s. the electricity just went out & our generator kicked in, so must sign off before internet goes down. Pls, to my friends around the globe, pray for us the next few days!!! Mercy is Very Good & grace & HELP TO THOSE WHO WILL NEED IT DESPERATELY after the storm hits land tonight. This entry was posted in Life (in general), Uncategorized and tagged faith, gale winds, Hurricane Irene, Hurricane Sandy, hurricanes, Joshua 1:9, prayer, stormy weather. Bookmark the permalink. Poleni Sana. GOG IS ALWAYS WITH YOU: BEHOLD TO YOUR FAITH. Prayers to you, Virginia! As I’m reading this, I hope that the worst is over and your family has weathered this storm okay. Those are some scary tree-branch-falling stories–whew, close calls!